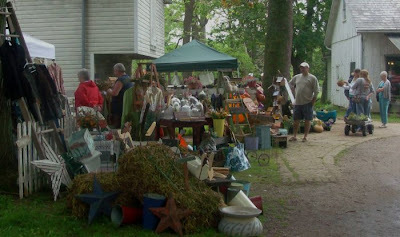 I stopped at the Mount Joy market the other day, and stopped at the Creekside Farm stand to chat with Josh. My eyes fell upon some beautiful baby beets, and I picked up a couple of bunches. Josh said, "You're going to eat those greens, aren't you?" It hadn't really dawned on me, to be honest, so I asked him if he had any suggestions on cooking them. He told me I was going to be back next week for more - and he might be right. Cook a couple of strips of bacon and some spring onions (which he just happened to have - this boy is no fool), and then toss in the chopped greens. A little salt and pepper, and that's it! Around here we just don't use a lot of bacon, preferring ham hocks for the traditional regional dishes that we grew up with, so bacon is more of a ... ahem... condiment. Because of that, I generally have some of the crappy pre-cooked stuff in the fridge. Using that meant 2 things - this dish took less than 10 minutes to whip up, and also it required a splash of olive oil. After the gastronomical excesses of yesterday, this was a perfect meal. That's the thing about farm markets. You talk to the person who grew the food, and they can usually suggest ways to cook it. In fact, the first time I roasted beets was at the urging of another farmer. One note - Next time I will use red onions, because they pick up red from the beets. I know in my brain that it doesn't make one bit of difference, but have a "thing" about onions taking on odd colors from other ingredients. Well.. mostly reds and purples. Try this if you get the chance - it is delicious! Waking up yesterday morning, I realized something was different and it would never not be different again. My sister and I have always thought that it was pretty cool that we got to have kids that got along like siblings. They are each our onlies; she has a son, I have a daughter. They know each other's friends well, and we have found great pleasure in the kids' friends too. 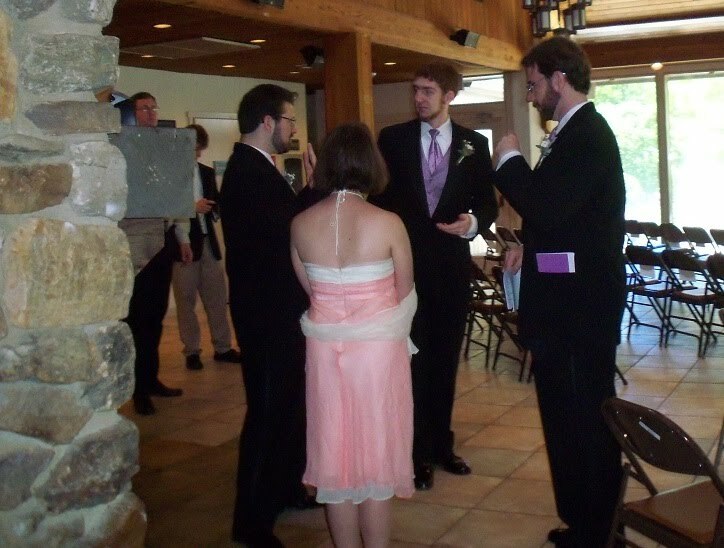 Yesterday, the first of this group was married. We'd managed to escape this particular trauma for longer than most parents, but the day had finally arrived. Sonny has been part of the extended family since he and Rob became friends in 7th grade. He met Andrea a few years ago when the kids all took jobs at the Renaissance Faire nearby, and the rest is as they say, history. The wedding was beautiful, planned down to the finest detail, and the food was absolutely amazing. Still, I couldn't at first shake the feeling that the walls were closing in. And then, as I looked over at Maryanne and saw her tearing up it hit me - they weren't ever going to be a gang of kids anymore. Our children had moved up a step on the ladder. They are adults, and we can't deny it. Somewhere between the crab cake table and the 4th or 5th waiter bearing tasty morsels - or maybe it was the wine - I surrendered. I watched the kids dance together, and I watched Molly converse with the adults without a care in the world. I watched her move through the whole thing full of confidence and excitement, and realized that she is fully prepared for the world. Sonny and Andrea (now known as "the Harmans") beamed as their day went on, and they both looked like they were clear on their course, sure of each other - and sure of themselves. The antics on the dance floor were hilarious. Our friend Val was there, and that was just a bonus. We haven't had a chance to sit and talk for years, and that was wonderful. Here she is with Maryanne and Bob. And so, another chapter begins. I hope this book never ends. Hell's Belles - NYC is wild and wooly! Hard to believe, but we sent the file for the Jul/Aug issue of The Essential Herbal to the printer, and headed back to NYC to see our dear friend Laura Daniel in a staged reading of Hell's Belles about 300 feet off Broadway. Here is a review of the play when it was performed earlier in another venue...Review with pictures. Two trips to NYC in 2 weeks.... I'm ready for some slow time! It was a lot of fun, though! To begin with, we hadn't seen Laura on-stage for an embarrassingly long period of time, and it is just so cool to see someone come to life and be so... HUGE! She played Salome, Janis Joplin, Judy Garland, and Joan Crawford - and slipped into each character seamlessly. It was breathtaking! The others in the cast were exceptional performers too, and I expect to see them all in other parts - coming soon, to a movie near you ;-). First we wandered around the city for a little bit, and stopped in at Rosie O'Grady's for a delicious lunch. There was a restaurant across the street with kilted waiters, but since it was early in the day... that just seemed like it might have required alcohol. On either side of the Irish Pub there were restaurants - one Italian, another Chinese. I love NY! Being from an area that can smell chocolate from 4 nearby towns on a good day, with Hershey being one of them, I was a little shocked at this - an entire block of Hershey. If you've ever been to the town of Hershey, you'll know what I mean. Hershey is a quaint little town, with nothing like this! So it was Fleet Week, and the Navy was in town! It was very reminiscent of a 50's movie to me, and we sat at a small table in the middle of Times Square for 45 minutes or so listening to a band playing pop music. Maryanne and Rob took to the stage after the reading was over. Don't they look natural? Honestly, the two of them should never be left alone for any length of time...I'd worry about the fate of the world. Traffic was really something in the city. The holiday weekend and whatever else was going on had Maryanne a little... concerned. Those taxis. I'm pretty sure they were the inspiration behind the bus in Harry Potter, the way they seem to get very, very skinny to slide between lanes, and then fluff back out to fly down any opening! Laura is still fresh as a daisy after her performance. We went up to the roof to relax for a few hours before heading home. It's such fun to talk about old times and dish about old acquaintances. The four of us have never once been at a loss for words in the nearly 20 years we've been friends. Years pass, and it just continues to get warmer and easier. I love to look at the vistas from the rooftop garden on Rob and Laura's building. Just standing there and imagining all of the people, all of the life going on in all those buildings and apartments! The sounds and energy from the streets rises to the roof, but it is muffled to something that is more bearable. Penn Station in NY was crazy. We forgot about the upcoming holiday weekend and it looked like a lot of people were taking 4 days. There were some long delays and a LOT of very visible security - dogs, soldiers, police, and rifles. Not at all like last week, when although I'm sure there was plenty of security, it was not stationed every few feet. The proof of the magazine was waiting when we got home. I love my printer. They got the go-ahead this morning, and it's almost like we never left. Memorial Day Gifties - us to you! 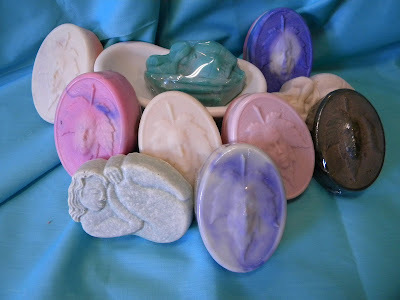 For the next week - until May 31, 2010 - Here at THE ESSENTIAL HERBAL we'll be giving who place an order worth $50 or more (not including shipping) the option of either taking free shipping OR we'll slip one of our molded soaps into the order at no charge. The molded soaps are mostly one of a kind, and they aren't available for sale. At the end of most of our pours, I generally pull over a fancy mold and use it to catch the rest of the soap. Sometimes there are a couple of kinds of soap in one bar. Sometimes they're layered, sometimes swirled, and we will choose one for you :-). Please let us know in the comments section of the shopping cart if you'd like the soap or free shipping! So visit our website, and see what we have! We'd love to drop a soap in there! The gardens are really going to town right now. It is still shocking to me to be putting plants in as this is our usual time to be planting, but all around the perennials are making it seem like I missed the boat - like that time a few years ago, when I planted before the frost date, and had to do it all over around Memorial Day. The valerian is in full flower. The fragrance is heavenly, and last year I found that tincturing the flowers rather than the roots made for a pretty good medicine. It is milder than the action of the root, but very relaxing. It doesn't require that the plant be dug up, either. That's one of the best parts. 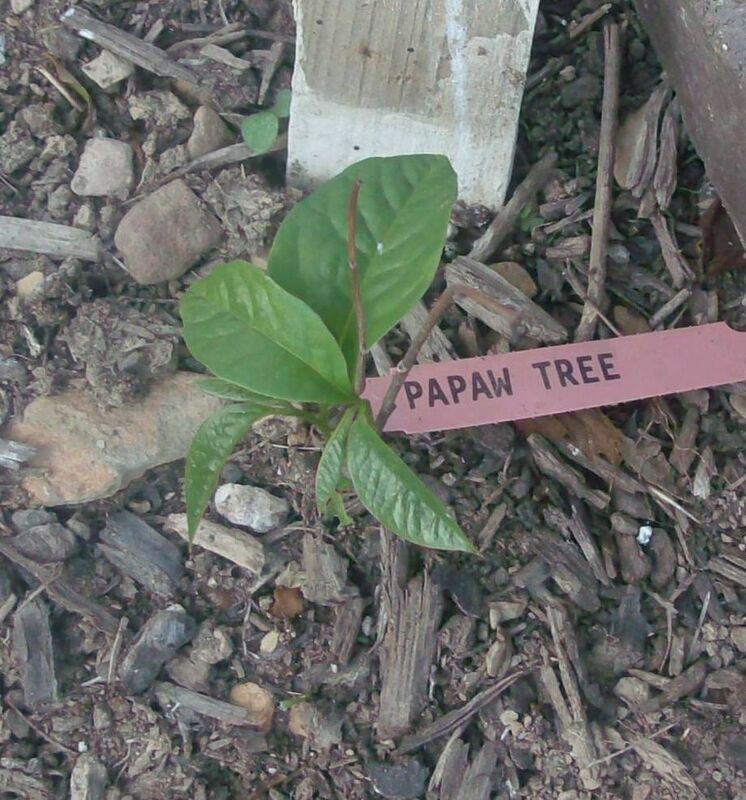 Here is my Papaw tree. It is 3 years old. It needs some new soil, and I just happen to have a couple of scoops from deep in the woods. 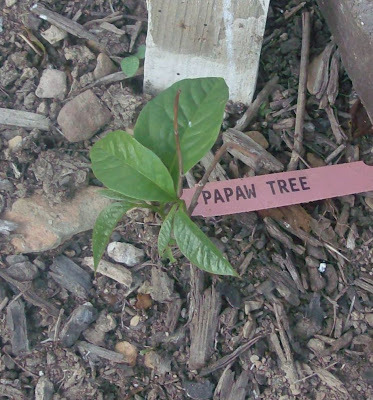 We'll see if that doesn't help, but seriously, this isn't Papaw country. Putting some coffee grounds in with the soil around the blueberries this year really helped them grow, so we'll add some here too for the acid. 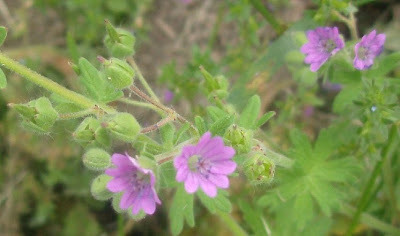 This little weed is Herb Robert, one of the wild geraniums. 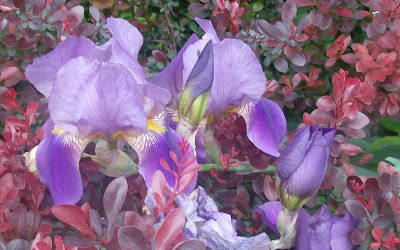 The flowers are perhaps 1/2" in diameter, but they are massed in front of one of the flower beds. They should come out, but are so pretty that they may stay during their bloom. Certainly they will reseed and return next spring, so I won't feel too bad about that. 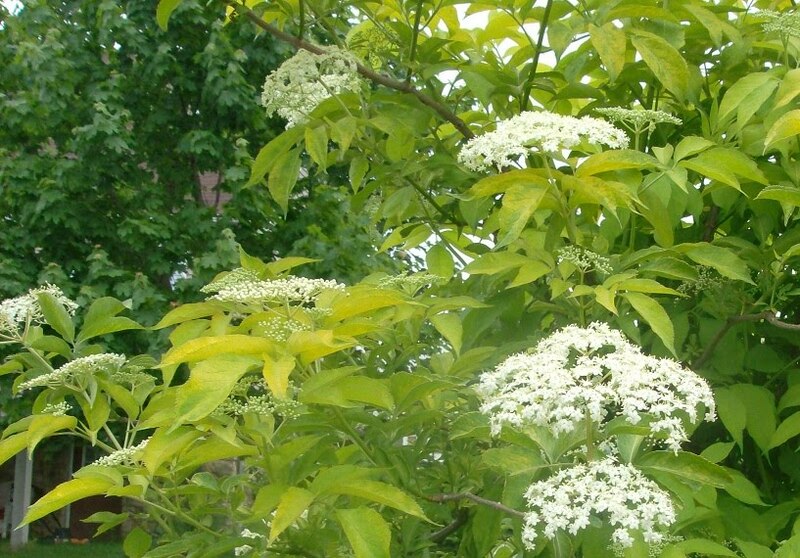 The elderflowers are coming right along. 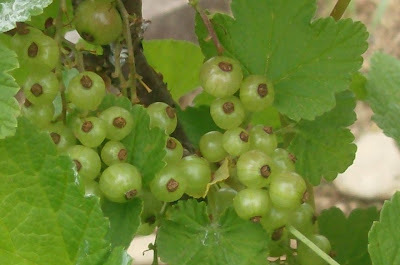 These are from an early variety, but the other bushes of canadensis or nigra have tight little buds now too. Elderflowers are edible. 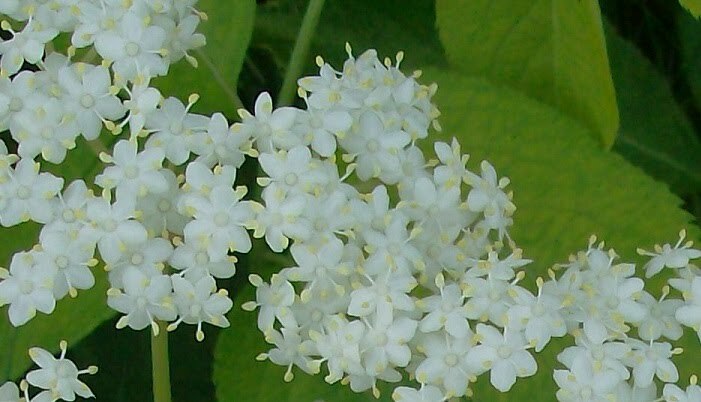 You can dip the whole umbel into crepe or pancake batter, and make fritters with them. 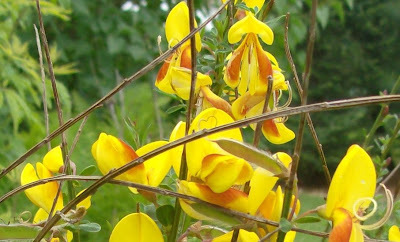 They can be made into a cordial, and they can be used in teas and skin preparations. It takes a lot of flowers to amount to anything when dried, and that means less berries. This early variety is not as tasty, so I don't mind losing the berries and using the flowers. 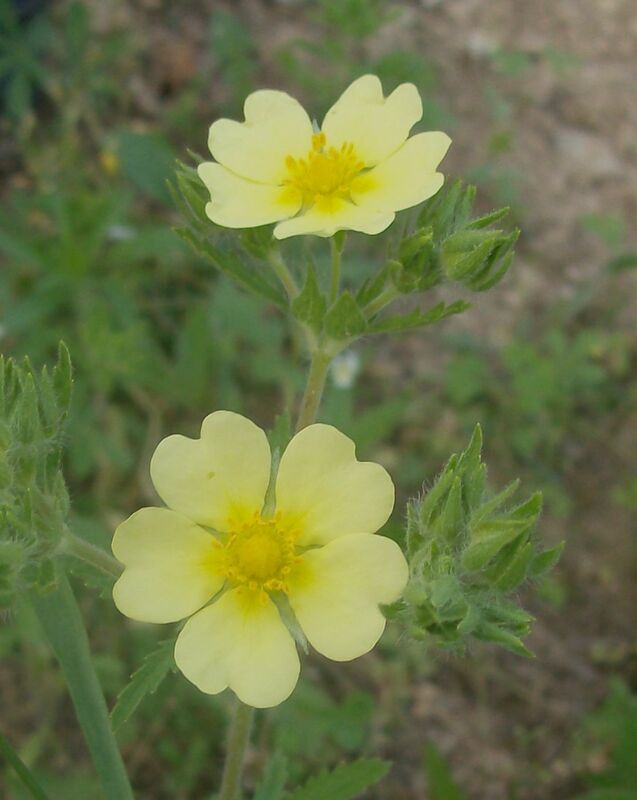 The cinquefoil (aka five-finger grass) is already in bloom. Yesterday afternoon I noticed buds, but they were open last evening. This is usually a late June bloom around here. It is a noxious field weed with roots that can apparently withstand the magma beneath the earth's outer crust, but the flowers look so innocent. I need to do some research on this plant, and find uses. It is so tenacious; that in itself tells me to look into it. 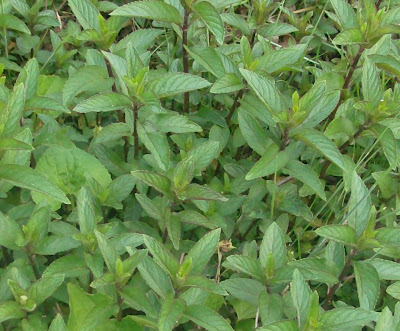 There are mint patches in various places throughout the property, and this is the chocolate mint. It yields a spectacular essential oil and hydrosol. Delicious in both cooking and tea, it is close to peppermint without the same bite. Mints can be hard to tell apart, but the stems and veins of the chocolate mint - along with the vague chocolate scent - makes this one unique. 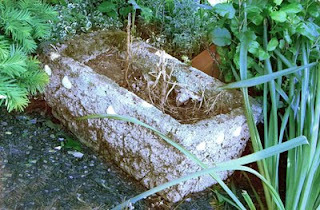 It creeps slowly out into the yard, so as I sat weeding it last night, the mint beneath me filled the air with its scent. Chive blossoms are just lovely. 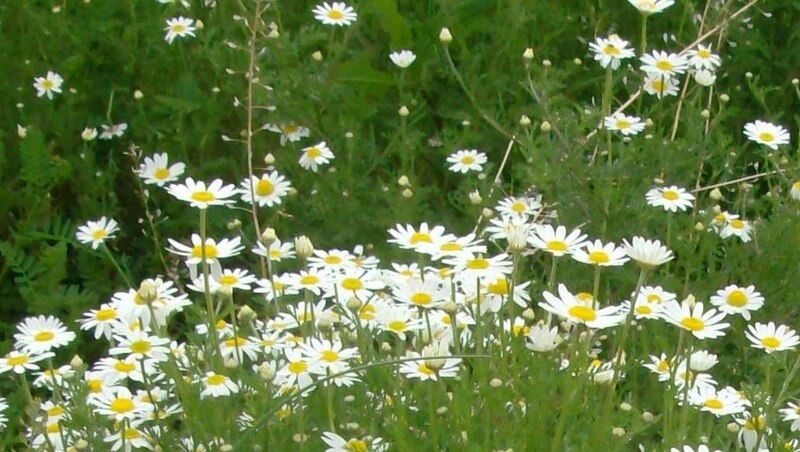 They are one of the first herbal flowers of the season, and they wave gaily, their delicate blooms hoisted aloft on sturdy blue-green stems. The blossoms make a beautiful pink vinegar, and they can be torn into pieces and scattered on a salad. 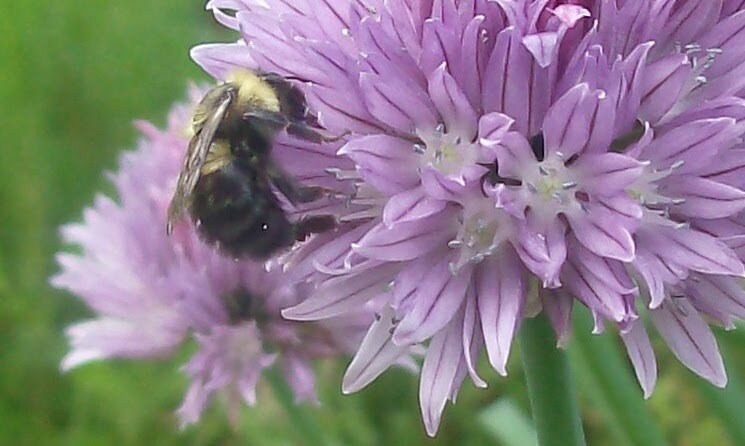 This bee seems to agree with me. 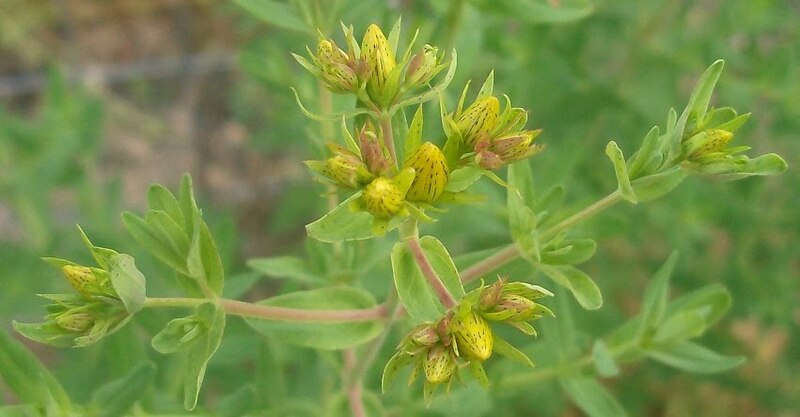 Lastly, the St Johnswort. It is blooming already! 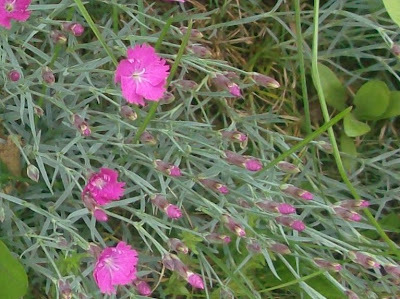 Typically it blooms around June 21st, as it was named for St John, who is honored on June 21. I've mentioned before that having blogged for 5 years, I can look back and see where things were at this time in years past. SJW, I don't need to check. This is early. There are 5 patches of SJW scattered around the gardens here. 3 are in bud, 2 close behind. 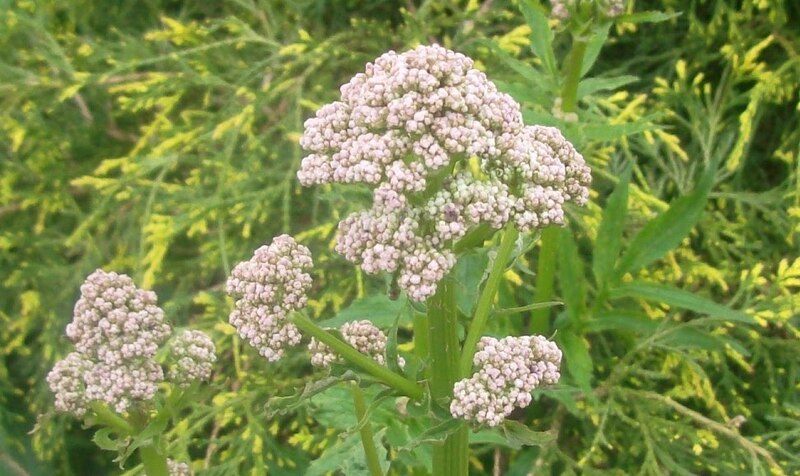 The buds and tips of this plant can be used both internally and externally. 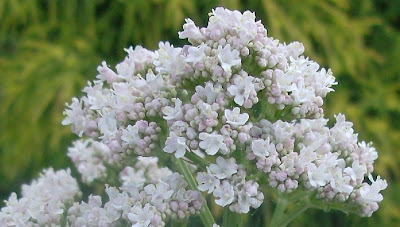 Internally, it is often used for mild depression and nervous conditions. Externally it works especially well on sores that are caused by the various herpes viruses - like cold sores, chicken pox, shingles, and genital herpes. The nerve endings in our skin respond well to SJW. It is well preserved in alcohol for tincture and in oil for external uses. It can also be dried for teas. There is so much going on outside, and we're still busily putting the finishing touches on the upcoming issue before sending it off to the printer. It is somewhat strange to be looking at all this beauty while thinking about the oil being pumped into the Gulf of Mexico. Even at this distance, I can't help wondering how this will affect us all. I am so confused about the season and time of year. Tomorrow is our official date to safely plant tender herbs, flowers, and vegetables, yet we've had some very cold nights in the past week. On the other hand, my garden seems to think it is much later than mid-May. The Roman Chamomile is going to town, but the German is still pretty green mats of foliage. The spicy pinks are spreading around the front edge of the garden. 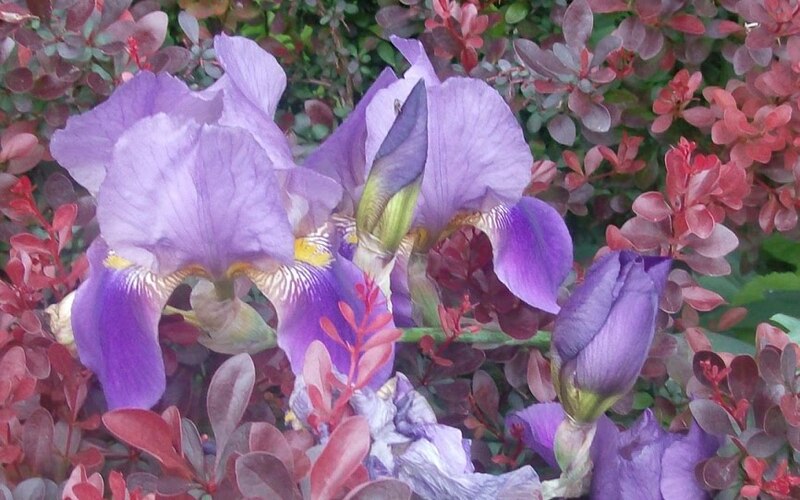 Beautiful, vibrant irises laze against the red foliage of a barberry bush. Chives provide the lone color in the culinary herb border at the moment, but they'll soon be joined by others. 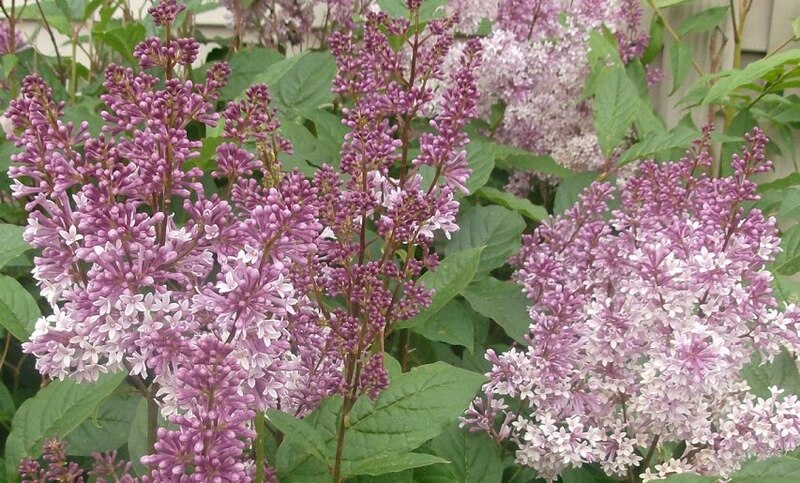 A late blooming variety of lilac is blooming. It usually blooms in mid-June. 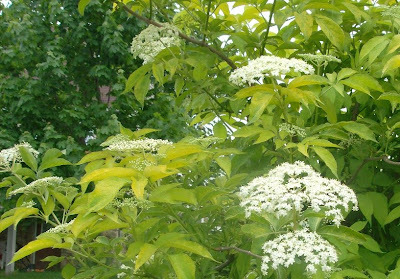 Although this is golden elderberry (just the leaves - the berries are large as small blueberries, less sweet than the canadensis, and I rarely use them), and it always blooms and fruits early - this is a record. Mom called these bluets, but I don't think that's what they are. When I embroidered a lot, this type of flower was often depicted in the early American samplers and I loved to add them to my works. You'd think I'd know what they are, but so far I've been too lazy to look it up. Maybe centauria? A fancy variety of broom, these blossoms are 3 to 4 times larger than their wild cousin. A nice healthy valerian plant sprung up across the driveway from the mother plant. Again, this seems a might early to me. There is a ton of weeding to do, and then perhaps I'll go pick up the plants that are on order over at Cloverleaf and get them in the ground. 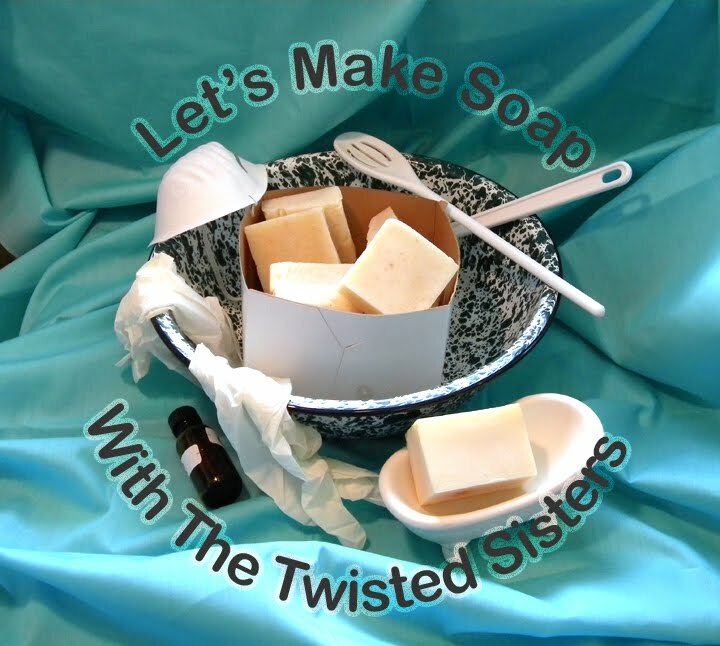 Come join us for our latest round of herbal classes with The Twisted Sisters here at Lancaster County Soapworks/The Essential Herbal. 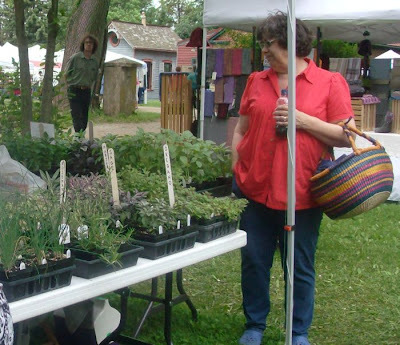 This summer, we will cover many topics, from garden containers to medicinal herbs to soapmaking. Make a hypertufa planter(left) and/or an ornament for your yard. Hypertufa is a light weight cement based material. Enjoy lavender lemonade & lavender shortbread cookies. 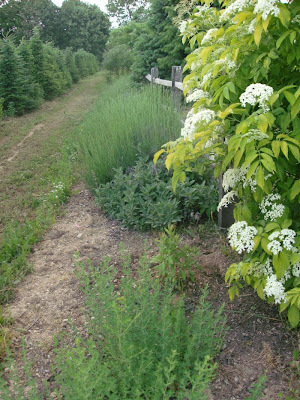 We will discuss a number of medicinal herbs, their traditional uses and how they are taken or applied. 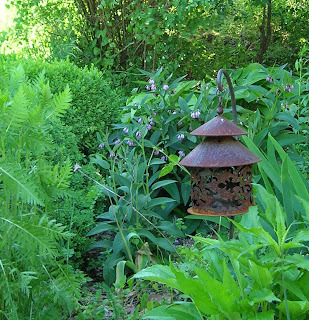 In the picture to the left, three wonderful, helpful plants growing together - echinacea, yarrow and comfrey. As Mary Poppins says, "A spoonful of sugar..."
A demonstration and discussion about these tasty ways to take medicinal herbs. Take home samples & recipes. Take home samples & recipes. Learn to make fragrant herbal beads from powdered herbs. We will also be making a focal pendant with plant material and odds and ends embedded in resin. You'll be taking home the beads and pendant that you made. 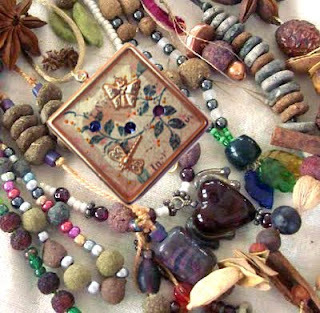 We'll explain how to string them all together to make a one of a kind herbal necklace. We will show you how to make soap - and remove the “fear of lye”. You will come home with samples, recipes, instructions and confidence to make your own. Kits and other materials will be available for purchase. With all our classes, you will receive printed handouts with pertinent recipes and instructions included. When you register for a class, we will supply more information including anything you may want to bring and specific class location. Late this winter, Maryanne and I made the decision to take a break from events this year, doing only the things that we'd already firmly contracted to do. It was one of the best decisions we've made in a while. 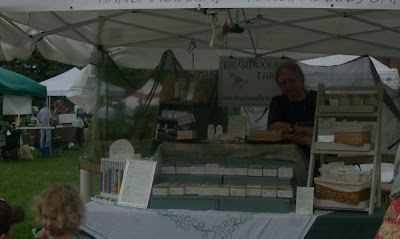 It allowed us to offer our friend Kathy from Cloverleaf Herbs our help at Landis Valley Herb and Garden Faire this past week while still being able to visit with friends and do a little shopping. We were also able to drop into the Mount Joy Farmer's Market on Saturday to pick up some of the first strawberries of the season before heading to the faire. We feel like kids bagging classes in school! Here Maryanne is, beside Kathy's magnificent herb plants. We were heading out to hunt for some goodies. Right up the way a bit, there was a booth full of all sorts of yard art and garden inspired home furnishings. This is Diane from Brushwood Farm, and I have to apologize for the shot. Diane is really cute, so I think I may have to get my camera checked out (it is having real issues with contrast lately). She slipped me a wonderful tube of violet lip balm, and I just love it! 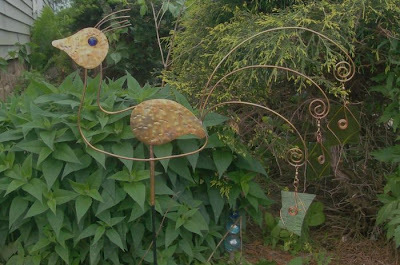 Besides a very vigorous and reasonably priced passionflower vine from Deer Creek Herb Farm, I came away with this crazy bird sculpture from G Wiz Workshop, out of Ruffsdale, PA. It hasn't found a permanent home in my garden yet, but it makes me smile every time I look at it. There are several more opportunities for herbie fun coming up in the next month - especially if we are careful when putting together our upcoming class schedule. This is really turning out to be a fun spring! Violet Syrup over Strawberries - mmmmmmm! I have to share this recipe because it was shockingly delicious. There are no pictures because it is all gone (for now). The other night I wanted to make a little something special for dessert. There were some nice strawberries (not local yet, but it was a very special occasion) at the store, and I purchased them and a single slice of cheesecake. After slicing up the strawberries, I sprinkled them with a little sugar and stirred them up to get the juice going, and then drizzled them with a tablespoon or so of violet syrup. This could actually be just about any floral syrup - rose would be very good too. A lot of the flavor in violet syrup comes from lemon zest that I simmer in the water - and then the key ingredient - a single drop of rose geranium essential oil is added to 8 to 10 ounces of the finished product. If you've never made a floral syrup, you simply make a strong infusion using the fresh flowers, and then use that to make a simple syrup. So... the slice of cheesecake was cut in half, and the strawberries were spooned over the top and sides. Then the whole thing gets hit with a dollop of whipped cream. It was one of the tastiest things I've had in a while, and that tiny hint of rose geranium oil sent it right over the top. This past week has been simply stunning, packed with the herbie adventures that make life so enjoyable. I will admit that it started out with a sense of being overwhelmed, but taking each day as it came, they unfolded full of fun and learning. 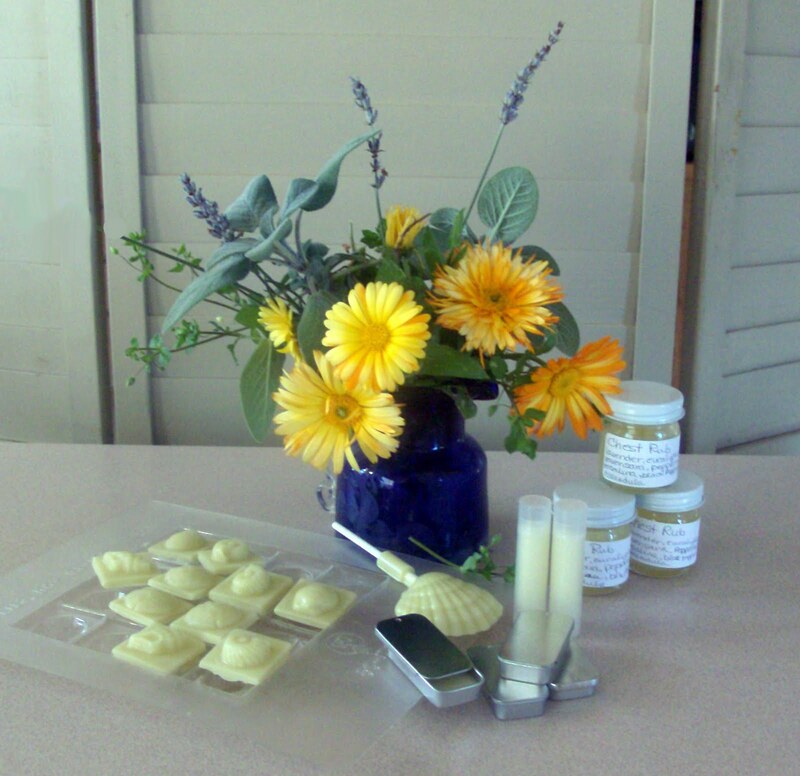 The week started with the typical Monday of packing orders for The Essential Herbal and Lancaster County Soapworks. Tuesday Maryanne and I taught separate soap classes and we each had a pretty good time doing it. Wednesday we caught up on orders again, and set about obtaining some items that we needed for another soap extravaganza. On Thursday, we went to Emergence Farm. Last fall we met Haas, who has this wooded wonderland, and I asked if he'd like us to try to identify the things he has growing on his property - which is mostly a north-facing steep slope. Sarah Campbell came along, and we were met there by a few other people who were very interested in learning what was growing there. It was one of the most enjoyable weed walks I've been on in a long time! Everyone involved had something to share as far as knowledge, and the sense of kinship was palpable. It was such a great morning - perfect weather - AND.... we found lady's slipper and morel mushrooms. Those are 2 things I've been searching for a very long time. Just to see them in the wild. 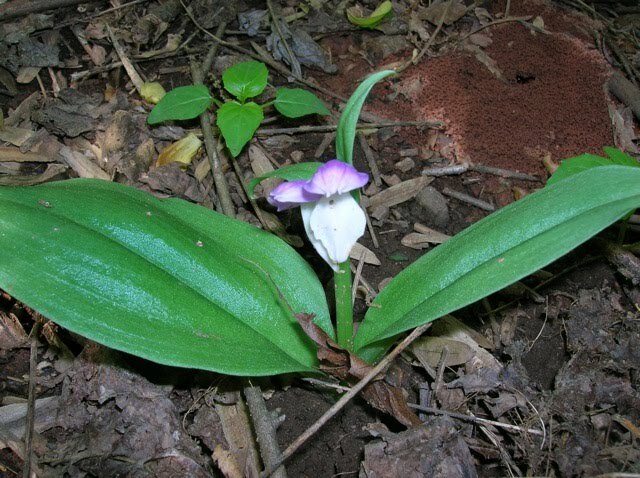 Naturally, there were many, many other amazing woodland plants, and we could scarcely take a step without tripping over black cohosh, bloodroot, sweet violets, and mayflower. The perfect morning. Only wintergreen could have improved it :-P.
That afternoon we finished gathering soap ingredients, and proceeded to make 8 batches of soap to refill the skimpy shelves. 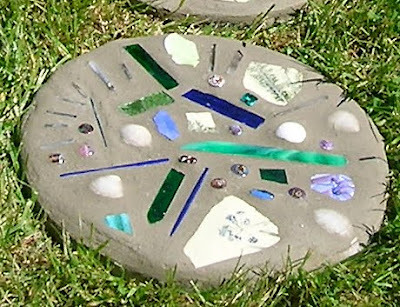 We'd made arrangements earlier to take a class with Emily Shuey to learn how to make concrete stepping stones that included things like stained glass, broken pottery, seashells, crystals, and beads. We were a few minutes late for the class, but managed to catch up with everyone quickly. This morning we had agreed to help our friend Kathy Musser at Cloverleaf Herb Farm. Before I left, I mentioned it on Facebook. What a GREAT surprise to get to see some friends because of that AND meet a Facebook friend that I'd never met in person before! That was really something special. At some point I suppose the time will come to face the weed patch out back. Tomorrow looks to be wide open. But so far, this spring has been a whole lot of fun.